Hi, lovelies. Today's #blogtober14 prompt is a good one: Best Advice You've Been Given. -my mother always preaching autonomy. Always placing an importance on being independent and a free thinker. Being proud of who you are. -mom on clothes: "it looks different on the hanger... try it on anyway." She's always right about that one and I now tell all my friends this. -my grandparents always stressed the importance of family and their advice usually pertained to family. -my grandpa on marriage: "Remember, when you get married you marry their family as well. Choose wisely." & his answer to the question "what makes a lasting marriage?" was always "laughter". 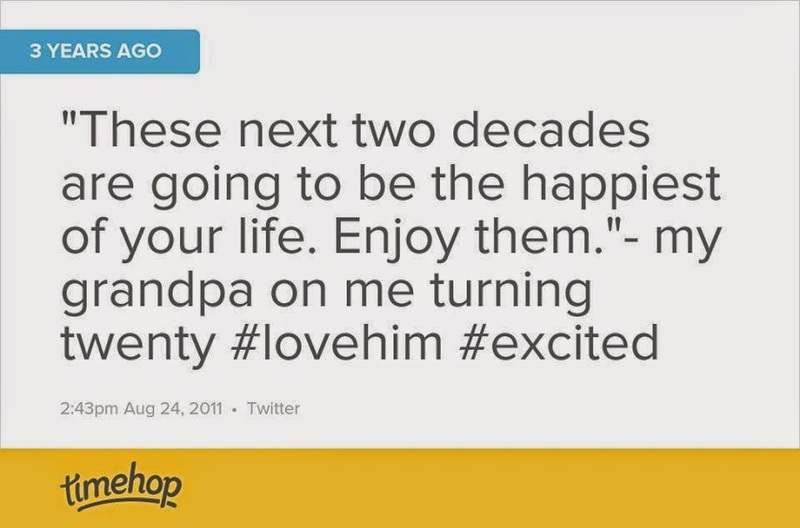 (my grandparents were married for over 55 years before he passed away so I think he's on to something). -"One piece of wisdom I would like to leave you is to enjoy and live your life fully. Don't worry about all the "rights" and "wrongs" that other people have placed on you. You are a wonderful human being with good common sense. Go out in the world and live your life fully making decisions based on your feelings and create who you really are and want to be. And know if they are your true feelings, based on making you the highest person you can be, then they will be the "right" choice for you, your family, and friends." -"Try not to always take the "safe" path. Live life to its fullest and try many paths. Be sure you try as many difficult and challenging paths as possible. As you get older you will realize that those paths will be the most beneficial. Also, remember that all great people had at least one person who made the difference in their lives. Try not to shut somebody out too fast - they may be your difference maker!" Love my people. Looking forward to reading all the advice everyone else has received in their lives so far! Thanks again to Taylor & Helene for hosting! I'm gunna go have a slice of my pumpkin coffee cake I made earlier this week (a recipe I'll be sharing tomorrow!) with a cup of something steaming hot. Oh, how I love October. Happy Sunday! I love this! Especially the marriage/laughter one!